Madrid (AFP) – Stamping her heels to the brisk strumming of a guitar, Merche Esmeralda, 68, twirls her black shawl in the sunshine as the Madrid traffic streams by a roundabout behind her. At an age when most top ballet and contemporary dancers would long ago have hung up their pumps, this flamenco star still shines — and now a generation of new artists is rising to follow. “This is a great time for flamenco. There is an impressive new generation, extremely technically accomplished in singing, guitar-playing and dancing,” said David Calzado, a specialist flamenco blogger who writes for ABC newspaper. 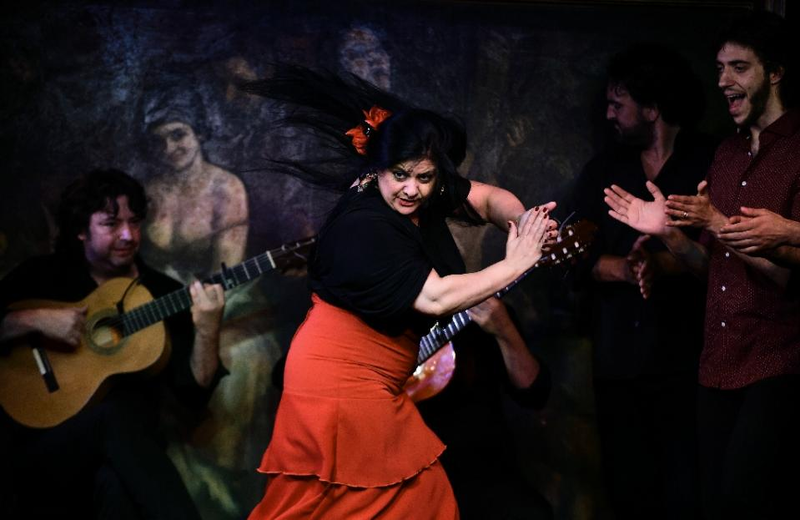 Esmeralda was the poster girl at June’s Flamenco Madrid festival, for which her open-air dance was a promotion. From August 6 to 22, the small southeastern town of La Union hosts the Cante de las Minas International Festival — the most important date on the flamenco calendar, said Rafael Manjavacas, director of the specialist website deflamenco.com. Spain was plunged into mourning when De Lucia died in February last year at 63. The new king Felipe VI bowed his head at De Lucia’s coffin. “He was the international figurehead of flamenco. Now there is no figurehead that we know of,” said Manjavacas. Nevertheless, “there are lots of good guitarists who are helping flamenco evolve greatly”, in the spirit of De Lucia himself, who shocked purists by flirting with jazz and rock. “There is also a very good generation of dancers who are adapting to new ways” and fusing their art with contemporary styles they encounter on their travels, he said. Four years after the passing of another giant flamenco figure, the singer Enrique Morente, De Lucia’s death cast a shadow over a flamenco world already suffering from an economic crisis. Among younger flamenco artists, “many, particularly dancers, live off what they earn outside Spain,” Calzado said. Elsewhere, countless “tablaos” — dark, intimate flamenco bars — resound with rhythmic clapping and shouts of “Ole” throughout the summer in Madrid and across sweltering Andalusia. “There has been a major comeback of tablaos” in the past three or four years, led by the legendary Corral de la Moreria in Madrid, said Calzado. A big name in Pamplona and La Union will be the 34-year-old singer Estrella Morente — daughter of the late Enrique — who will share the stage with dancer Israel Galvan, 42. Artists like Esmeralda, whose flamenco “duende”, or spirit, is still strong. “In life you have to know your limits and I am older now,” she told El Pais newspaper last month.